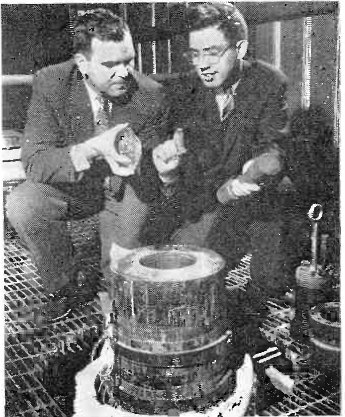 English: R. A. Sullivan and R. A. Ladice examining synthetic quartz crystals grown in the autoclave shown in Western Electric's pilot hydrothermal quartz plant in North Andover, Massachussetts in 1959. Until WW2, quartz crystals used in electronic equipment were natural crystals, mined in Brazil. Shortages due to military demand for quartz led to postwar efforts to culture synthetic quartz crystals. AT&T's Bell Labs first developed a process that was capable of industrial production, growing quartz crystals at high pressure and temperature in the autoclave shown. By the 1970s virtually all quartz used in the electronics industry was synthetic. This 1959 issue of Radio and Television News magazine would have the copyright renewed in 1987. Online page scans of the Catalog of Copyright Entries, published by the US Copyright Office can be found here. Search of the Renewals for Periodicals for 1978 to present show no renewal entries for Radio and Television News. Therefore the magazine's copyright was not renewed and it is in the public domain.